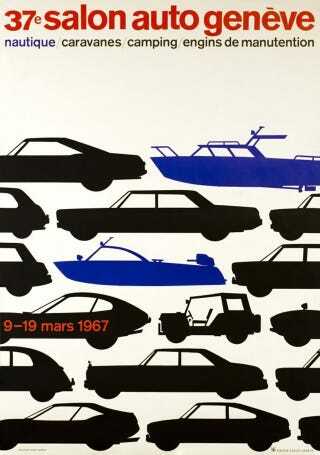 Can You Name All The Cars In The 1967 Geneva Auto Show Poster? This is the official poster for the 1967 Geneva Auto Salon. You like it. You want to put it on your dorm room wall. But first, you need to know what all these cars are. I'm pretty sure that these are all silhouettes of real cars and not just generic car illustrations, so you shouldn't have too much trouble. I'll start you off with my favorite on the poster: that's a Buick Riviera in the upper left-hand corner. Remember when a Buick built one of the most handsome cars on the road? Good times. Can you ID all the rest of these cars? Hat tip to Christine Hardigree via Pinterest!